There are many different ways to create Tickets in the software! One option is to click on the Tickets Tab and select the green button on the right that says 'New Ticket'. Fill in the fields, the problem description does get emailed like any public ticket comment. The email will have your header and footer on it, and a link to the customer profile where they can view the ticket. You are able to create more custom fields for the new ticket page, and also adjust the items in the drop-down boxes. The ticket system tries to help with workflow, but you can ignore that if you want. It starts out with the ticket needing a diagnosis. To do that, just put a comment on the ticket with the subject 'Diagnosis'. Now the ticket will no longer be pink in the ticket list, it's a regular in-process ticket. "Per our phone call, thanks for approving us to proceed with the repair - we'll contact you as soon as it's ready!" Now the ticket will have the second item in the progress list checked off, it's been diagnosed, and approved, and you are ready to do the repair. Be sure to comment every 3 or 4 days if the job is going to take a while to complete, that will keep the ticket from turning yellow or red in the ticket list. It's a good practice to make 'public' comments instead of hidden tech notes, or at least make one public comment for every hidden comment. This way your customer will be comforted with the knowledge that their repair is progressing, and keep them from calling in asking for a status update(usually frustrated). The Tickets Tab is best thought of as a overview page. By default it will display any tickets that are "Not Resolved" (closed/finished) but you can filter and change the sort to fit your needs. 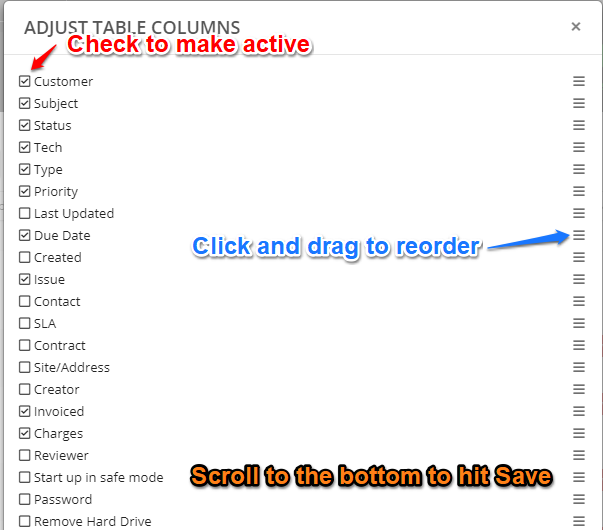 There is also a Customize button that you can use to choose what data columns are displayed on the page. Clicking the Customize button will present a pop up where you can make your selections. NOTE: We do not limit the amount of selections. Choosing to many can result in a harder to read page so be careful. Anywhere a ticket number appears in Customers, Tickets Tab, Estimates, or Invoices there is a hover-over icon that can be clicked to view that Ticket's information, Resolve, Print or View recent communications without having to go fully in to the ticket. It is possible to take a Ticket Comment and split it off to a new ticket. This is especially helpful in situations where a client emails you on a old ticket or about a question/issue separate from the current work being performed. 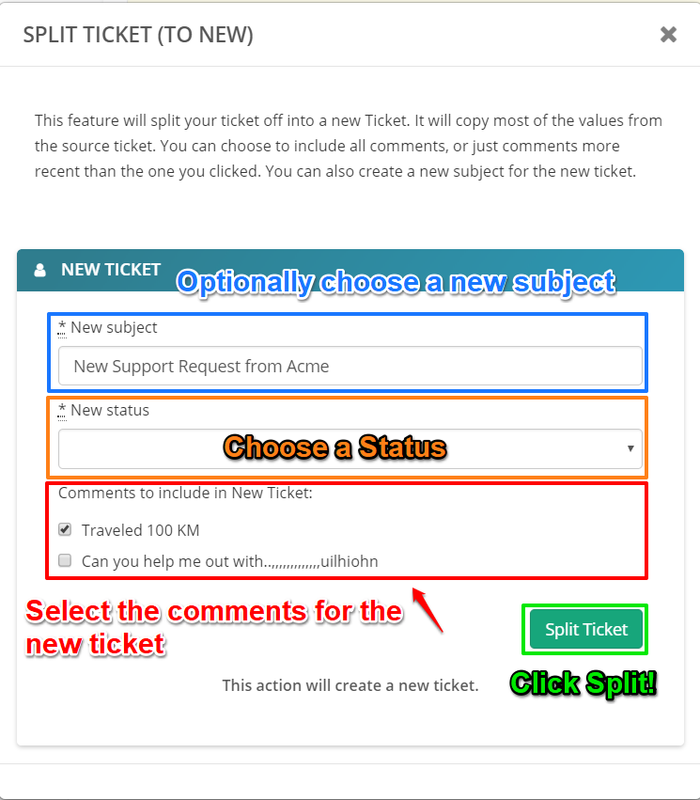 Start by heading to the Ticket Comment you want to split and clicking the contextual menu, then Split to New Ticket. A Pop-Up will appear and you will have several options to choose from for the new ticket. After having made your desired selections and changes, hit Split Ticket. A new ticket will be created and a private comment will be added to the ticket with the origin number of the original ticket. Now that you have finished their repair, there are a few ways to proceed. First of all, to close the ticket, just go to the ticket and change the status to 'Resolved' - that's it! Once resolved, the system knows you are done with that job, and it won't show in the ticket list any more. When the repair is complete, but you are waiting for the customer to come pick it up, use the status 'Invoiced' - to mean, invoiced, but here waiting for the customer to come - it will be green in the ticket list. When the repair is complete, and you want to bill the customer, use the 'Make Invoice' button on the ticket detail screen, it will link the invoice to the ticket, and if you like, it will put the ticket details on the bottom of the invoice. Once the customer comes to pay, you go back and change the ticket from Invoiced to Resolved. If you forget, the system will email you a note every day about tickets that are open with a paid invoice attached.